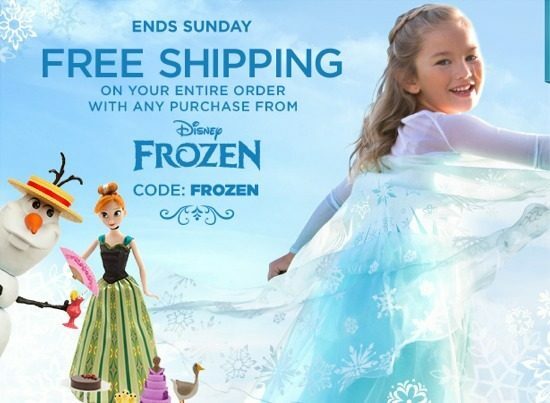 FREE Shipping on ALL Orders When You Buy Any Disney Frozen Toys, Clothes + More! You are here: Home / Great Deals / FREE Shipping on ALL Orders When You Buy Any Disney Frozen Toys, Clothes + More! FREE Shipping on ALL Disney Frozen Toys, Clothes + More! I’ve got an AMAZING deal for all you Disney lovers! This weekend only, through Sunday night, you can snag FREE Shipping on ALL Orders When You Buy Any Disney Frozen Toys, Clothes + More! Just use coupon code FROZEN at checkout!